Tom Fuller, professor in Georgia Tech’s School of Chemical & Biomolecular Engineering, believes that understanding how and why fuel cells fail is the key to both reducing cost and improving durability. that new materials, new manufactur-ing processes and new designs are required to improve the durability of fuel cells and in turn lower costs. Researchers in the Center for Innovative Fuel Cell and Battery Technologies believe that understanding how and why fuel cells fail is the key to both reducing cost and improving durability. 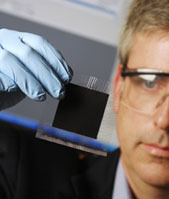 The center takes a multidisciplinary approach to fuel-cell and battery research. It serves as a catalyst for development of revolutionary advances through world-class research integrated across disciplines and spanning from fundamental discovery to application-specific prototypes. Tom Fuller, professor in Georgia Tech’s School of Chemical and Biomolecular Engineering, believes that understanding how and why fuel cells fail is the key to both reducing cost and improving durability. Fuel cells can be expensive and they typically don’t last as long as their internal combustion counterparts. Researchers in the Georgia Tech Research Institute’s (GTRI) Center for Innovative Fuel Cell and Battery Technologies believe that understanding how and why fuel cells fail is the key to both reducing cost and improving durability. Center director Tom Fuller has been trying to solve what he deems the top three durability problems since he joined GTRI from United Technologies in 2004. 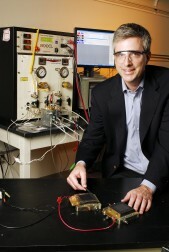 “My philosophy is if we can really understand the fundamentals of these failure mechanisms, then we can use that information to guide the development of new materials or we can develop system approaches to mitigate these failures,” said Fuller, who is also a professor in Georgia Tech’s School of Chemical & Biomolecular Engineering (ChBE). The problems Fuller is addressing include chemical attack of the membrane, carbon corrosion and platinum instability. Fuller described progress toward solving these problems last month at the 212th Electrochemical Society Meeting. In a typical fuel cell, hydrogen is delivered to the anode side of the cell that contains a catalyst, such as platinum. The platinum splits the hydrogen molecules (H2) into hydrogen ions and electrons. On the cathode side of the fuel cell, an oxidant such as a stream of oxygen or air is delivered. With a proton exchange membrane in the middle, only hydrogen ions can travel through the membrane to the cathode. Electrons travel on a different path through the electrical circuit to the cathode, creating an electrical current. At the cathode, the hydrogen ions combine with oxygen and the electrons that took the longer path to form water, which flows out of the cell. Fuller’s research shows that the membrane, commonly made of a synthetic polymer, is prone to attack by free radicals that create holes in the barrier. The free radicals are formed by the decomposition of hydrogen peroxide (H2O2), a strong oxidizing chemical that can form near the membrane. Since a typical membrane is approximately 25-50 micrometers thick, or about the thickness of a human hair, it’s impossible to see the degradation peroxide causes with the naked eye. In a paper published in March 2007 in the Journal of Power Sources, Fuller and professor Dennis Hess, research scientist Galit Levitin, and graduate student Cheng Chen, all from ChBE, used X-ray photoelectron spectroscopy (XPS) to study the membrane degradation. This work was funded by GTRI, ChBE, and the Lawrence Berkeley National Laboratory. The researchers chose XPS because it is a quantitative technique that uses X-rays to measure the presence and quantity of chemical elements and the formation and breakage of chemical bonds within a material. The solution will be difficult because the formation of hydrogen peroxide requires only hydrogen and oxygen to be present. Since these chemicals are readily available in fuel cells, hydrogen peroxide can be produced many ways. The problem is further complicated because free radicals are short lived and difficult to detect. Fuller will leave the actual engineering of new non-degrading membranes to the materials scientists, but what he has learned can guide what properties new membranes should have and how they can be tested for degradation. Another challenge with low temperature fuel cells is that a blockage can occur on the anode side of the fuel cell, possibly from a water drop formed in the fuel channel. The blockage causes carbon (used to support the platinum) to corrode, turn into carbon dioxide and leave the fuel cell as a gas. Frequently starting and stopping the fuel cell also causes this mode of failure. This can be catastrophic for the fuel cell because without carbon, the platinum catalyst layer collapses and disappears. “If this happens, the fuel cell can be destroyed in days rather than years,” noted Fuller. This problem is more common in non-stationary fuel cell applications, such as cars that require the fuel cell to start and stop when the vehicle is turned on and off. “Researchers know this problem exists, but we’re trying to build physics-based detailed models to evaluate different fuel cell designs that will reduce the susceptibility to this type of corrosion,” said Fuller, who’s working on this project with Norimitsu Takeuchi from Toyota’s material research department and students Kevin Gallagher and David Wong with funding from Toyota. The models can also be used to determine options for controlling and mitigating this problem to find a more effective alternative material that is more resistant to corrosion. Another problem with fuel cells cycling on and off is that platinum has a small but finite solubility in the acidic membrane given the high electrical potential and oxidizing environment at the cathode. When the platinum layer dissolves, a band of platinum typically forms inside the membrane. Fuller, GTRI senior research engineer Gary Gray and graduate student Wu Bi, developed a model to predict where the platinum band would form to help to understand why it was happening. This work was published in March2007 in Electrochemical and Solid-State Letters. “We found that the platinum can also be deposited throughout the membrane and it can move around to different places, but whenever it leaves where it’s supposed to be, it’s no longer effective,” said Fuller. Fuller aims to understand these very small platinum particles by modeling the transport and thermodynamics of the particles in fuel cell systems. This work was funded by Hyundai Motors Corporation. A gift of $200,000 from the Hartley Foundation allowed Fuller to purchase new research equipment to continue studying the degradation of fuel cells and how to improve/extend the life cycle and technology of these energy devices. The Lawrence Berkeley National Laboratory funding came from the Assistant Secretary for Energy Efficiency and Renewable Energy in the Office of Hydrogen, Fuel Cell and Infrastructure Technologies of the U.S. Department of Energy under contract number DE-AC02-05CH11231 through subcontract 6804755.